Ocean Galleries Galleries (9618 Third Avenue, Stone Harbor, NJ/609-368-7777) welcomed world-renowned 3-D artist, Charles Fazzino, for a spectacular Memorial Day weekend exhibition. Considered the most popular 3-D artist in the world today, Charles Fazzino has developed an instantly recognizable style that is admired and coveted by many including heads of states, celebrities, and numerous internationally renowned figures and organizations. Best known for his obsession with bright colors and wonderful detail, Fazzino has a frenetic energy that he infuses in his work and uses a unique, hand-assembled, 3-D layering technique that brings his images to life. Click here to view more of Charles Fazzino’s artwork. “Flags and Liberty Heads” – Copyright ©Peter Max 2016. All Rights Reserved. 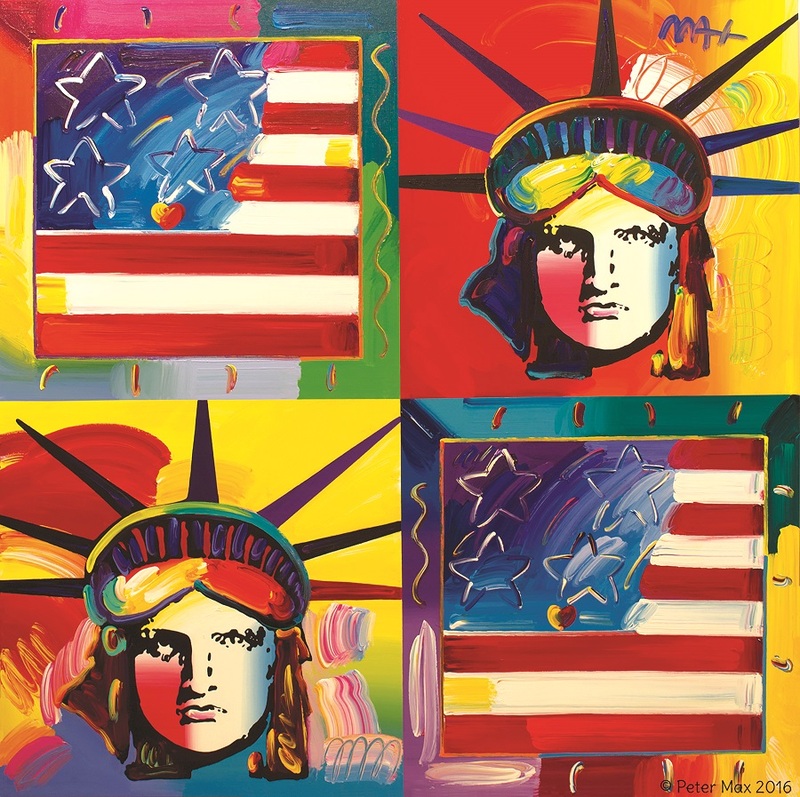 In what has become a beloved Stone Harbor tradition, the one-and-only Peter Max returned to Ocean Galleries over the Fourth of July weekend, with his newest artwork and a collection of his most-revered imagery spanning early five decades. One of the most famous of all living artist’s, Peter Max has solidified his status as a pop culture icon – his bold colors, uplifting images, and uncommon artistic diversity have touched almost every phase of American culture and inspired many generations. In 2015, Peter Max turned the talented coaches of ‘The Voice,’ into a work of art for NBC’s print, digital and outdoor campaign celebrating Season 9 of the hit show. Peter painted portraits of coaches Adam Levine, Blake Shelton, Gwen Stefani, and Pharrell Williams in his signature, bold and colorful, expressionistic style. Earlier in 2015, Max was commissioned to create the program cover art and poster art for the 30th Annual Rock and Roll Hall of Fame Induction Ceremony in Cleveland, Ohio. Throughout his career, Max has painted colorful, commissioned portraits for six U.S. Presidents, world leaders, the Pope, the Dalai Lama, Marilyn Monroe, Frank Sinatra, The Beatles, Taylor Swift, and many other celebrities and rock and jazz musicians. The Fourth of July holiday is particularly special for Max, who has painted our Lady Liberty annually since America’s Bicentennial. Click here to view more of Peter Max’s artwork. She’s been called “one of the most important artists of her generation” by the Walt Disney Company and “a creative genius” by the Discovery Channel. In August 2016, Ocean Galleries welcomed back the incredible Autumn de Forest, who held her first solo exhibition at the Stone Harbor gallery in 2011. Often described as a child prodigy, the talented 14 -year-old artist made history this spring as the youngest painter to ever have a solo museum exhibition when her works were displayed at the Butler Institute of American Art (Butler, PA). Autumn de Forest has been a professional painter for more than half her young life and has had an incredible journey. Her wide-ranging projects have included a line of Converse Chuck Taylor All Stars™ (sold exclusively at Nordstrom stores nationwide) and being honored by the Vatican for her creativity, humanitarianism, and charitable works. 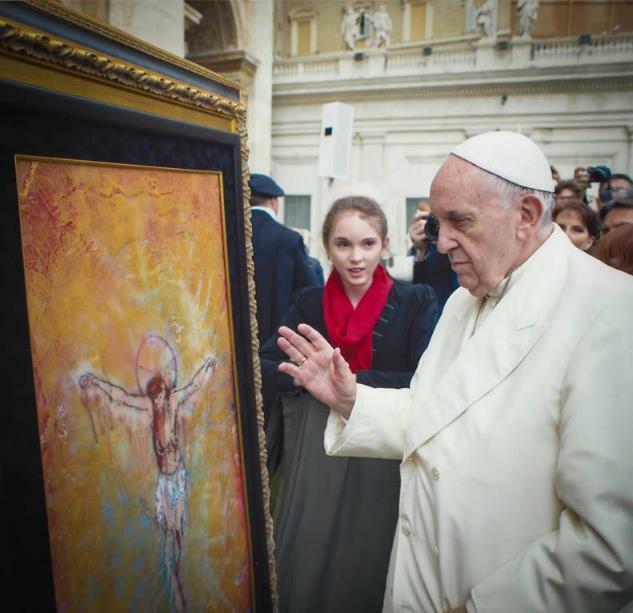 This past year, Autumn was extended a private audience with Pope Francis, where she presented him with her painting “Resurrection”, which now resides in the Vatican. The multitalented and poised young artist has commissioned six-figure works of art and has garnered national and international acclaim for her imaginative artwork. Her artistic style has been compared to iconic abstract painters including Andy Warhol, Jackson Pollock, and Pablo Picasso. Autumn’s exhibition at Ocean Galleries will feature a collection of all new artwork, many of which were created specifically for the show. Click here to view more of Autumn de Forest’s artwork. Click here to see Autumn de Forest as she visits the Helen L. Diller Vacation Home for Blind Children in Avalon, NJ.